Graham, local manager from Office Lenders, has a problem that most Office Temp managers don&apos;t have to deal with at all. 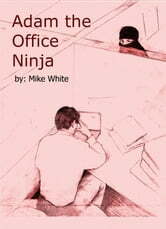 One of his workers thinks, in all sincerity, that he is a ninja. See, most people don&apos;t get reports on their desk from clients complaining of being hit with paper throwing-stars. They also don&apos;t hear that someone is breaking dress code at their job- not by wearing a Hawaiian shirt, but by wearing a black mask and frightening old ladies at a flower shop. But that&apos;s OK, Graham will make Adam into an ideal office worker,even if he has to trick him into it. After all, its what a ninja would do.